"Gobowling.com 400" redirects here. For the Kansas race formerly known by that name, see KC Masterpiece 400. For the Watkins Glen race, see Go Bowling at The Glen. For the Dover race of the same name, see Gander Outdoors 400 (Dover). The Gander RV 400 is the second of two Monster Energy NASCAR Cup Series stock car races held at the Pocono Raceway in Long Pond, Pennsylvania, the other being the Pocono 400. Starting in 2007, the race was moved from its traditional July date into August, swapping dates with the Brickyard 400. In 2008, Sunoco, the official NASCAR fuel supplier, based in Pennsylvania, and the Philadelphia region of the American Red Cross, agreed to sponsorship of the race and charity events to benefit the American Red Cross South Pennsylvania-Philadelphia region. It marked the first time since 1996 that the event carried a title sponsor. Camping World took over title sponsorship of sponsorship through its Good Sam Club in 2011. The race was a 500-mile (804.672 km), 200 lap event from its inception in 1974, through the 2011 race. 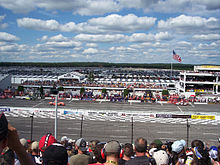 On August 10, 2011, it was announced that both Pocono races would be shortened to 400 miles (643.738 km), beginning in 2012. The Bowling Proprietors' Association of America, through its marketing arm Strike Ten Entertainment, signed an entitlement sponsor for the 2013 and 2014 editions. In 2015, Microsoft signed a one-year deal to title the event with its' new Windows 10 update, and in 2016 the race returned as the Pennsylvania 400. In early-July 2017, the Marine and Watersport franchise Overton's signed a three-year deal to sponsor Pocono's second race weekend through 2019, which includes not only the Cup race being renamed the Overton's 400, but the 150-mile Camping World Truck Series race will be known as the Overton's 150. However on February 6, 2018, the speedway announced that Gander Outdoors will sponsor the race with the Gander Outdoors 400 as well as the Camping World Truck Series race with the Gander Outdoors 150. The Overton’s sponsorship was transferred to the Chicagoland race. The 1973 ACME Super Saver 500 was one of four stock car races (1971–74) at Pocono under USAC sanction. The first three were won by Butch Hartman, Roger McCluskey, and Richard Petty. McCluskey's 1972 win came in a Plymouth Superbird and came when the race was run in conjunction with USAC's Schaefer 500 in late July when a hurricane postponed the IndyCar race. The 1974 ACME Super Saver 500 was run on April 24, 1974. Buddy Baker won the pole and led nine laps but finished 20th with a burned valve. USAC stock car series regular Butch Hartman led 124 laps before his clutch failed with eight to go. Ron Keselowski won the race having led 61 laps total. Keselowski is the brother of Bob and uncle of Brad (Bob's son). 1974: NASCAR shortened its races in the first half of 1974 due to the energy crisis; the crisis had passed and in July races, including Pocono, were put back to their full distance. Additionally, Pocono was not listed on the original 1974 NASCAR schedule; a 300-mile (480 km) race at Trenton Speedway was listed in several issues of Stock Car Racing magazine, notably the magazine's June 1974 issue. The Trenton date was subsequently switched to Pocono. Pocono broke 40 official lead changes in seven of the first nine NASCAR-sanctioned Pennsylvania 500s (1975–77, 1979–80, 1982–83). 1975: David Pearson's win came amid controversy; his Mercury, sponsored by race sponsor Purolator filters, was leaking oil in the form of smoke throughout the race's final ten laps but NASCAR waited until two laps to go to wave a black flag at him, by which time it was too late, since drivers are allowed to stay out for three laps before heeding a black flag. Under current NASCAR rules, if a black flag is waved within the final five laps (offside (illegal pass before crossing start-finish line on start or restart), out of bounds (below double yellow line on restrictor plate tracks or cutting a chicane), or inappropriate driving), and the driver does not respond, he will be assessed a time penalty that will be calculated into final results (often a penalty that moves the driver to the last car on the lap they were running, or a lap penalty). 1976: The next year, 1976, Pearson led 14 times for 124 laps but blew a tire with two to go, giving Petty the win. Bobby Allison, nursing injuries sustained in a short track crash in Elko, MN weeks earlier, battled for the lead in the first 40 laps but during a pitstop took off with unsecured left side tires; they fell off in the track's Tunnel Turn. The lead changed 47 times among eight drivers. 1977: The 1977 running was sponsored by Coca-Cola. Darrell Waltrip won the pole, his first on a superspeedway (photos from the race were used by Sports Illustrated in an October piece on Waltrip). The lead changed 46 times among seven drivers as Benny Parsons held off a late charge from Richard Petty for the win. 1978: The 1978 running saw the fewest cautions (1) in track history. Darrell Waltrip edged David Pearson for the win. 1980: Neil Bonnett escaped with the win on the final lap as Buddy Baker forearmed alongside up high but Cale Yarborough pushed Bonnett into the lead and Baker and Cale banged together. The lead changed 50 times among ten drivers. Meanwhile, Richard Petty crashed on lap 56 when the right front wheel snapped; Chuck Brown spun behind him and Darrell Waltrip T-boned Petty. Petty broke his neck but because he didn't want to be sidelined he hid his injury for months until an x-ray taken of him 4 weeks later found that the injury deteriorated over time. This resulted in officials making drivers be cleared by doctors after any kind of wreck no matter how hard the impacts are. 1982: Dale Earnhardt's chest injury in 1979 was followed by a leg injury in a tumble in Turn One with Tim Richmond; the crash pierced the boilerplate retaining wall, requiring 40 laps under caution to repair. The race was a ferocious affair as the lead changed 46 times and on several laps changed three times in one lap. Richard Petty ran low on gas in the final laps and Darrell Waltrip ran out on the final lap, securing the win for Bobby Allison. 1986: Richmond won the Pennsylvania 500 in 1983 and 1986; in 1986 he was involved in a crash in Turn Two with Richard Petty; he drove backwards to pit road and lost a lap, then got it back when Earnhardt crashed twice in a span of ten laps; he got four tires with five to go, then passed six cars before winning in a wild three-abreast finish with Ricky Rudd and Geoff Bodine. Neil Bonnett suffered an arm injury on the restart after Richmond's wreck; Morgan Shepherd spun in the Tunnel Turn and several cars plowed into the scene; Bonnett slid into the inside guardrail, flopped onto his side, and landed on four wheels. 1989: The track's boilerplate wall was pierced three times in 1989 - in June Geoff Bodine broke his leg (and didn't find this out until days later) in Turn One; in July Jimmy Horton pierced the wall in Turn Two; during the lengthy yellow for repairs a jack rabbit got onto the speedway near the start-finish line; it escaped initial attempt at capture by the track safety crew but was caught unharmed minutes later and released into the nearby forest. Later in the race in One Greg Sacks and Lake Speed hammered the wall in One and Sacks took a wild tumble reminiscent of Earnhardt's 1982 flip. The boilerplate was replaced by concrete in 1990. Geoff Bodine and Rusty Wallace battled on and off throughout the 500, but Bill Elliott ran both down in the final 20 laps; Bodine spun out of second with 15 to go, then with seven to go Wallace skidded through the Tunnel Turn and Elliott took the win, tying him with Richmond for most wins at Pocono. 1990: Bodine won the Pennsylvania 500 twice, in 1990 driving for Junior Johnson and in 1994 driving the car formerly owned by Alan Kulwicki. His 1990 win came in a spirited contest; the lead changed four times on Lap 117 between Bodine and Davey Allison and three times on Lap 180 between Bodine, Allison, and Rusty Wallace. 1993: Dale Earnhardt won after a spirited affair; on several laps the lead changed twice to three times in a single lap between him, Ernie Irvan, Kyle Petty, Dale Jarrett, and a surprising Brett Bodine. Following the race he was given a Robert Yates Racing No. 28 flag and flew it while slowly driving clockwise around the track, a tribute to Davey Allison who had died in a helicopter accident days earlier, and Alan Kulwicki, who had died in a plane crash in April. 1995: Dale Jarrett scored his first win for Robert Yates in the 1995 race; he won it again in 1997. The 1995 running was the most competitive (37 lead changes among 13 drivers) since 1983 and once again the lead changed twice a lap on several laps. 2000: Jeremy Mayfield who won in June at Pocono, was well on his way to a season sweep of Pocono in 2000. He and teammate Rusty Wallace were battling for the lead in the final laps, when on the final lap, Mayfield blew a tire entering the Tunnel Turn, allowing Wallace to squirt by and score the upset. 2002: Bill Elliott became Pocono's first five-time winner. This race is also memorable for a wreck on the first lap, when Steve Park and Dale Earnhardt Jr. were sent into an old highway guardrail barrier on the straightaway, causing Park to flip violently. The race was shortened by 25 laps due to darkness caused by the repairs from the Park accident and a lengthy rain delay. 2006: In his Rookie of the Year campaign, Denny Hamlin completed a season sweep of Pocono. Meanwhile, Hamlin's teammate, Tony Stewart was the center of controversy after an on-track altercation with Clint Bowyer, where Stewart flipped Bowyer the finger and then intentionally crashed Bowyer, collecting Carl Edwards. Stewart was held multiple laps down and penalized 25 points. 2007: Kurt Busch dominated the 2007 race, leading a race record 175 laps. It was the final Pocono race before the debut of NASCAR's Car of Tomorrow. In this race it is remembered for the fact that Robby Gordon was disqualified by NASCAR for his actions the previous day at the NBS race at Montreal. Robby Gordon Motorsports' backup driver, P. J. Jones took his place in the No. 7 chevy. 2009: Denny Hamlin won the 2009 running after rain postponed the race from Sunday to Monday. Pocono had debuted NASCAR's double-file restart rule in June; in August it helped Hamlin gain positions with the leaders sometimes racing four abreast. 2010: Greg Biffle took two tires on the race's final pit stop to grab the lead; his victory snapped a 64-race winless streak. It also came in the first Cup race following a plane crash that left team owner Jack Roush hospitalized. Elliott Sadler, a day removed from winning the Camping World Trucks Series debut at Pocono, was involved in a violent melee also involving Kurt Busch; Sadler was spun out and punched the inside guardrail so savagely it ripped the engine out of his car and threw it several hundred feet (the crash was only caught on camera partially as ESPN cameras were trained on Busch). Minutes after the accident it was declared NASCAR's hardest wreck in history. The race itself began with a 100-lap period under green during which Jimmie Johnson put half the field a lap down, but a caution at Lap 124 set up a wild second half with several bouts of four-abreast racing up front. It marked the first Cup win of 2010 for Ford, and the first since Jamie McMurray won at Talladega for Roush on November 1, 2009 in the 26 car. 2011: Brad Keselowski, after being in a horrible testing crash at Road Atlanta earlier in the week, breaking his left foot and hurting his right foot and back as a result, held off Kyle Busch over the final 19 laps to win his second race of 2011. The race was almost called after 124 laps due to rain, but was restarted. On the final lap Jimmie Johnson and Kurt Busch made contact on the backstretch when Johnson drove into him. The two exchanged heat in an argument on pit road after the race. The race would wind up being the last 500-mile long NASCAR race at the track, as announced a few days after that in 2012 both races at the track would be changed from 500 to 400-mile events. 2013: The new Generation 6 car saw a very competitive race with 27 lead changes among 14 drivers. Jimmie Johnson won the pole, and dominated the first quarter of the race, but he ended up slipping to the back of the pack and a 13th-place finish after cutting a right front tire and hitting the outside wall on lap 78. Johnson was not alone, as David Stremme and David Gilliland also had right front tire troubles. Kasey Kahne dominated the second half of the race, leading 66 laps, and had built up a 7.5 second lead on teammate Jeff Gordon when a debris caution came out on lap 149, erasing Kahne's lead. Gordon managed to take the lead from Kahne on the next restart and led until Matt Kenseth spun to bring out another caution. On the resulting restart, Kahne retook the lead from Gordon and held off Gordon for the last two laps to win his second race of the season. 2014: A 13 car wreck broke out on lap 117 when Denny Hamlin spun in the entrance to the Long Pond Straightaway and cars behind him tried to check up. June race winner Dale Earnhardt Jr. took the lead with 14 laps to go and managed to build a 3.5 second lead over Kevin Harvick before a caution came out after Kurt Busch cut a tire. Despite the caution, he narrowly held off Harvick over a four-lap shootout to complete the first Pocono sweep since Hamlin's 2006 sweep. It was Earnhardt Jr.'s first sweep of a track in Cup competition since sweeping both Talladega races in 2002. 2015: A red flag happened early in the race when Kasey Kahne slammed the inside wall lining pit road on lap 6. After a caution-riddled first half, the last 68 laps were run caution-free, leading drivers to play the fuel mileage game. With three laps to go, race leader Joey Logano ran out of gas while trying to stretch his tank, giving the lead to Kyle Busch, who himself ran out of fuel just after taking the white flag. Matt Kenseth, running 15 seconds behind Busch at the white flag, sped past the limping Busch to score his first Pocono win and second win of the season, thwarting Busch's attempts at being the first driver since Jimmie Johnson in 2007 to win four straight Cup races. 2016: The 2016 running was postponed to Monday after rain soaked the track, Chris Buescher grabbed his first win after the race was called due to fog in the area, A red flag happened late in the race with 22 laps to go. The race saw a spirited duel for the lead between Kyle Larson and Austin Dillon where Dillon led Lap 78 by a wheel; Larson got back around him in One, then on Lap 80 Dillon stormed underneath Larson in the short stretch; in Turn Three the two collided and Joey Logano shot three abreast in to the lead. Logano was later involved in a crash when Denny Hamlin passed him and Chase Elliott got underneath him in the Tunnel Turn and both crashed. 2018: Darrell Wallace Jr.'s brakes failed, causing him to slide through the turn 1 grass, impacting the wall at a high rate of speed. On the restart, Erik Jones tried making in 3 abreast, only for Kyle Busch to swing round the outside. He would go on to win the race. 1974, 1986, 1991, 2012, and 2016: Race shortened due to inclement weather. 1979, 2009, and 2016: Race postponed from Sunday to Monday due to rain. 2002: Race shortened due to darkness and incoming rain after two lengthy red flags (one for track repair, the second for rain). 2005 and 2018 Race extended due to a NASCAR Overtime finish. 2012: Race distance changed from 500 miles (800 km) to 400 miles (640 km) in length. The race was shortened to 98 laps, 245 miles (394 km) due to rain, becoming the first time a Cup Series race at Pocono failed to go a triple-digit number of laps. 2017: Kyle Busch's first Cup win at Pocono is Toyota's 100th Cup win since joining the Cup Series in 2007. *: Benny Parsons was scheduled to be the color commentator, but was to drive an Oldsmobile in the 1986 Summer 500. Jerry Punch replaced Parsons during the SETN broadcast until he retired from the race. ^ "Pocono downshifting to 400 miles in 2012". Usatoday.Com. August 10, 2011. Retrieved August 13, 2012. ^ "Race Results at Pocono Raceway — Racing-Reference.info". racing-reference.info. Retrieved July 22, 2015. ^ "By the Numbers: Pocono". NASCAR. July 1, 2013. Retrieved July 31, 2013. ^ Sporting News Wire Service (August 2, 2010). "Biffle wins one for Roush, Ford at Pocono — Aug 2, 2010". Nascar.Com. Retrieved August 13, 2012. ^ Newton, David (January 1, 2008). "One dead, nine others injured in lightning strikes following NASCAR race at Pocono — ESPN". Espn.go.com. Retrieved August 6, 2012. ^ Gelston, Dan. "Fan Hit by Lightning Goes From Critical to Stable — ABC News". ABC News. Retrieved August 6, 2012. ^ Gluck, Jeff. "NASCAR Pocono Race Underway After 90-Minute Rain Delay". SBNation.com. Vox Media. Retrieved July 22, 2015.